I caved. I ordered Chanel Peridot. I couldn't resist it. 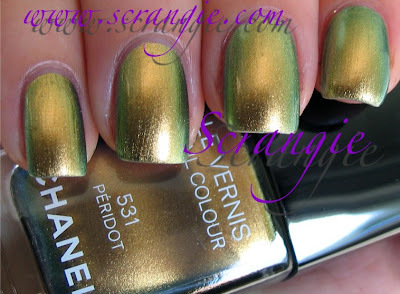 Chanel purchases are always the source of much internal conflict for me- I'm lured in by the color, but then I'm let down by the instantaneous chipping and ridiculous price. I can't always justify spending $25 on one single polish that will undoubtedly chip within the first four hours of wear... But this time, I'm glad I splurged. 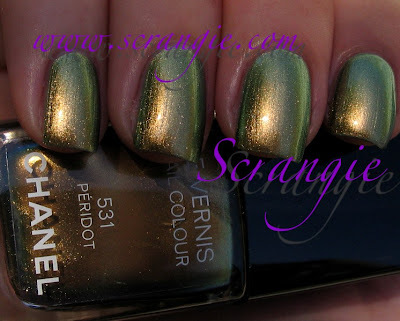 For your viewing pleasure, the lovely Chanel Peridot. 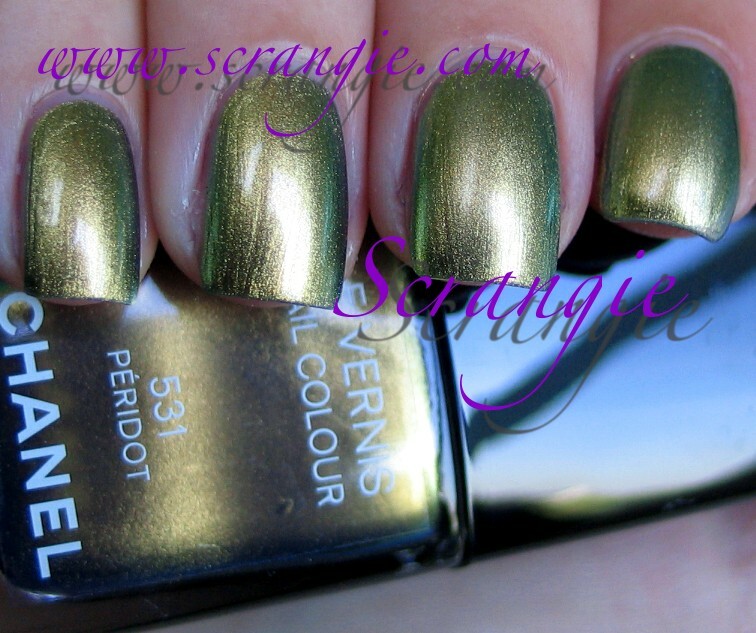 Peridot looks like a very strong duochrome in the bottle, with the two main colors being olive-gold and blue-green. Sometimes with these types of colors, the duochrome is only visible in the bottle and doesn't translate on the nail. In this case it does, albeit not quite so strongly. It shifts from olive and gold to a grassy green, from green to an aqua blue, and then to a golden orange and a hint of red. I didn't like this at first. When it was freshly applied, it was streaky and had no duochrome effect. As it dried, the frosty streaks disappeared and the multichromatic aspect of the polish intensified. It constantly changes with each movement of my hands; watching myself type is currently very amusing. I'm normally not a fan of Chanel's formula, brushes or application, but Peridot has a much better formula than any of my other Chanels. It's opaque in one coat and isn't overly thick or runny. It is a streaky, frosty mess while you're applying it, but once it dries the majority of the streaky frostiness disappears. It does take a rather long time to dry just like all the other Chanels I've used. The color is really something else. You know what it reminds me of? 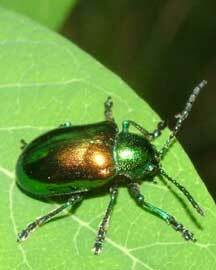 Peridot has that shiny green-gold-blue-red metallic color that I admire on beetles and houseflies. Such beautiful little creatures. I've been wearing Peridot since about seven o'clock yesterday evening and so far it hasn't chipped. That's a record for me and Chanel polish, so hopefully it's a sign of improved formula! Loving it. I feel like this is the kind of color that can transition between summer and fall very easily. One coat? Wow. I'm impressed. Dang. I was hoping to be able to get away from buying it. la la love! now if my nordies would get their shipment in already!! This looks nicer then I thought it would! I hate buying polishes this expensive but I might have to as it looks quite original to me. LOL at the comparison with bugs! hah i've buddied up to the chanel lady @Belks, heh she is supposed to call me when their shipment comes in. I hope she doesn't forget!! This and Graphite are so pretty I could cry. I broke down and got both. Graphite was disappointing when I painted it last night, but today in the light it's super-foil and multicolored. So so so gorgeous, both of them. Someone needs to dupe this ASAP. It kills me! I think I need this! Darn it I was trying to not want it. Thank you so much for sharing!!! It is lovely!!! I asked you to swatch it earlier today and Look, here it is ! You are too wonderful! Thank you!!! Egads, it's gorgeous! I usually don't go for greens, but this will be an exception. My Chanel Pearl Drop is probably one of my longest-lasting polishes in terms of chippage, but I apply 3 thin coats with an Essie fast-drying topcoat, not sure if that makes the difference. Hope it holds out for you as well as it's holding out for me. This reminds me a lot of WnW Ocean Grotto. Do you have it? A comparison would be sweet! Oh, awesome ! Gorgeous even! What a color, I need it! 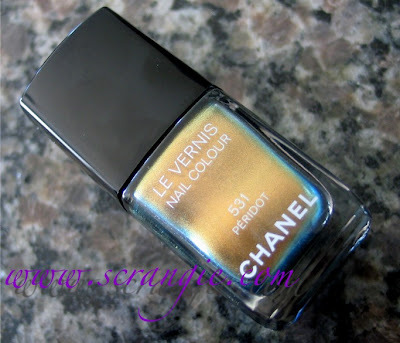 I don't have any problems with Chanel nail polishes, I don't necassary like many of the hyped colors, but the formula wears like iron on my, and applies like a dream! I've read about your chipping issues with the Paradoxal polish, and I was really afraid to buy it, but it's great, ale I wore it for 7 days without any chips at all! Maybe the European formula is better or something? I use Nubar Foundation Base Coat (great stuff) and Poshe on top. I want it I want it I want it. It's the only polish out of the three in the collection that i need to have. Not want, need. I recently put on Nubar Wildlife after being inspired by seeing promos of this polish. Now that I see these, Peridot seems a lot more yellow and golden toned where Wildlife is so reddish coppery. They probably duochrome the same green on the edges, however, and still strike me as somewhat similar even though the range seems different. I'd be curious to see a comparison of the two. Oh please someone find a dupe for this. I love this shade. I'm a green fanatic and I want this. I just can't spend the money on it right now. I owe $1042 more dollars to the dentist. I had root canal and have to pay for the crown and post. I'd rather buy polish but I can't stand the pain. This is so beautiful. and peridot is august's birthstone...so it's like...MEANT TO BE. This polish is unbelievable! I love how you compared it to beetles and bugs :P It should be named after a bug... 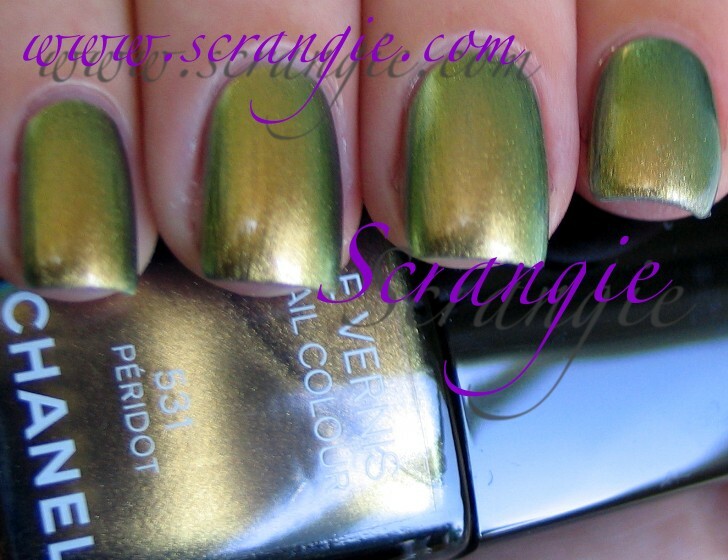 The Peridot stone is a medium Chartreuse, pretty but does not look very similar to the polish! Tammie, I thought the SAME THING. For $25, give the thing a real label! Sheesh. KarenD, I think I forgot to mention- I did two coats in the picture! But it is totally opaque in one so it doesn't really need the second. Carrie, Chanel must have tweaked their formula or something, because Peridot made it almost two days without chipping and it usually chips within the first few hours for me! Carina, I didn't think it looked much like a Peridot either, but I don't know anything about gems, so thanks for your input :D I love learning new things! Miremusings, you're absolutely right. The difference is that Wildlife is MUCH stronger, less metallic/chrome and has more green-purple-red shift. Peridot stays mostly gold and teal with green. NykkeyB, sorry, they're not even remotely alike. 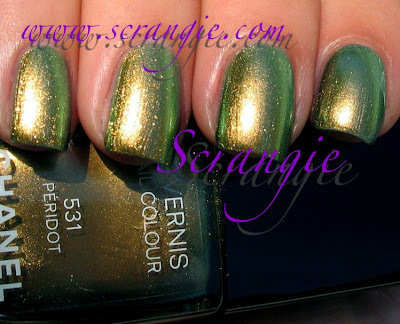 Hard Candy Beetle is a match to Orly Space Cadet but looks absolutely nothing like Chanel Peridot. I think it's prettier in the bottle but that's saying a lot because it's still a gorgeous color! I'd like to buy it and see if it'll chip even on my acrylic nails. I am thinking if I should buy one ChAnel Peridot or not. I bought Diving in Malasia from Sephora and they look very similar for me. Do you have it to try a comparison? Sephora DiM only needs one coat and last at least one week on my nails. Only problem is the bottle size, very small in my opinion, for a color like that it should be at least tree times the size, lol. 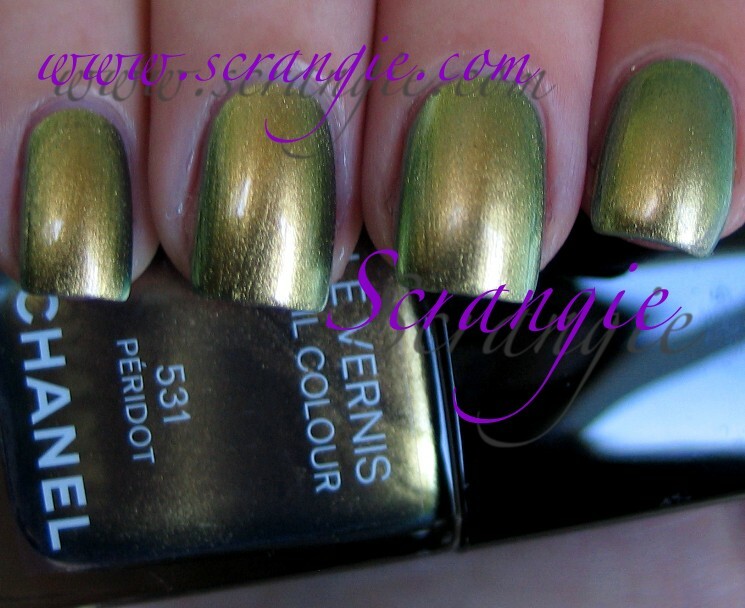 I was in the main Chanel store in Paris at the weekend and Peridot isn't available in Europe until 18th August. I was wearing the Sephora dupe, the sales girls thought that it was the real thing. Definately worth 4.90€ if you can't wait. 25$?! that's so cheap! It cost almost double that where I live!